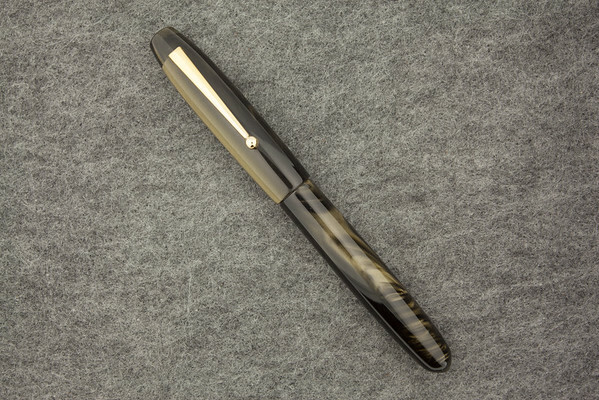 Edison Pen Co – New Materials in the Production Line! New Materials in the Production Line! We are happy to announce that we have 2 new materials coming to the Production Line! First is Burnished Gold which will be used in the Collier. This is a really nice pearlized material with a good mix of gold and some green tones. The material can be a bit random in that at some points it can have a real burly grain, and at some points it can be streaky. This material is replacing the discontinued Silver Marble. So there are now four Collier materials. Persimmon Swirl, Antique Marble, Blue Steel, and Burnished Gold. Next is Lapis Lazuli Flake in the Pearlette. This material has a bit of a Royal Blue or Lapis Blue base to it, but with some nice gold accents within the flake. This material will be very uniform due to the flake pattern. This Lapis Lazuli Flake will be replacing the Deep Indigo Flake, which is discontinued in the Production Line Pearlette as of today. If you like the Deep Indigo Flake, I’d recommend that you buy one now, as whatever our retailers have left is all that there is. Once they are gone, they are gone. So the Pearlette lineup now consists of Aztec Flake, Violet Flake, and Lapis Lazuli Flake. All of these pens can be purchased from any of our retailers that you see listed here.